Thanksgiving fast approaches, and because I like a challenge, I’m hosting 14 people this year on the Friday. On the actual day, Thursday, I’m going to my friends’ place and being cooked for, which I’m sure will make me grateful enough to then put in my own massive effort in the kitchen the following day. I recently wrote about my 2014 effort for Refinery29 here but now I’m only a few days away from single-handedly hosting the biggest dinner I’ve ever done. Although it must be said that, thank God, friends are each bringing something so that I am just in charge of turkey, mash, creamed onions, and sides like cranberry sauce and gravy and pumpkin pie. I can handle that? Rather: I can handle that with the help of Malbec! To prepare, I did buy groceries and ordered American specialty items, but I’m also mentally preparing by listening to the great Adam Sandler ditty “The Thanksgiving Song”, which any first-time listeners should be warned is not entirely appropriate. Happy Thanksgiving! Pour one out for the turkeys. In October and November, I did a bit of travelling around Europe, something I didn’t do enough of during the school year. Note to self: this winter, take a long weekend somewhere sunny before you forget what sun is! The struggle of Seasonal Affective Disorder (winner of the best acronym ever, SAD) is real and forceful here in England. First up was a whirlwind barely 48-hour trip to the Asturias region of Spain with my former study abroad roomie, Grace. Grace is in the US Navy and currently stationed in southern Spain, but when we were chatting and hit upon the idea of taking a trip together, she had just moments before booked a flight up North and was scrambling to see if she could move it or cancel it without a fee so I could come to the south. Having never been to Asturias, I just said: Why don’t we meet up there? I hadn’t done any research on what the trip would hold, and neither had Grace…nor did we until a day before we left. Turns out, you don’t need to plan ahead too much when you’re gifted beautiful weather and sights and partnered with a friend you haven’t seen in person for six years. The first of the two cities we visited, Oviedo is the capital city of the Asturias province. The cathedral, a central feature in many historically important Spanish cities, was gorgeous (see below; I wasn’t kidding about the weather, was I?). First order of business was sitting in the Plaza Mayor to eat patatas bravas made with queso cabrales and drink sidra and, every 15 minutes, saying “I can’t believe we’re both here” (this was me, Grace is far more pulled together when faced with the realities of six years apart). We toured the city squares and parks and stores, saw some gorgeous artwork (my fave, El Greco, included, as well as Dali and Picasso) and buildings, and then went for dinner. Let me just say, the term “4-cheese pizza” has a whole new meaning when you’re in a cheese-producing paradise. After dinner, we rambled about until we found a cute bar near the cathedral, and stopped in for a nightcap. The bartender was interested in our story, and why we spoke Spanish that sounded like it had once been good, so we bantered with him for a bit then went home to read by mutual decision. It was a great relief to have a travel partner who was on my level, wanting to see the touristy stuff but also to simply wander and discover, and who would rather have a long, lovely dinner and then get some rest. Had we wanted to do different things, we would’ve, but unless Grace is the world’s best liar, we agreed on everything. One of those touristy things was to take a bus out of the city to see two pre-romanesque churches built in the 800s, which my mind still struggles to comprehend. The tour guide told the story of San Miguel de Lillo, the smaller of the two churches, by saying it was built in the 800s and then, around the 12th century, suffered some serious structural damage because it was built near a river. And in 2015, it is solidly standing and you can do a tour in it. What! So even architects or builders who didn’t survey the land around them did a better job than anyone creating edifices today. If erosion over hundreds of years could’ve seriously been a factor in the structural integrity of your building, you’re doing all right. We had only one day in Gijón, so we decided to just do whatever time allowed. After a quick exploration of the seaside boardwalk and surrounding area, we visited the original Roman baths which had been excavated recently (recently being 112 years ago, because Spain) and which dated to the 1-4th centuries. That some of that brickwork was still standing, and made enough sense to build a museum around it, was mind-boggling. I know I’m American and therefore used to my country’s (non-Native American) settlements being only about 400 years old , but I’m glad seeing history standing in front of us still awes me. It should awe us all. “Creo que el horizonte, visto de la forma que lo veo yo, podría ser la patria de todos los hombres.” This roughly means, “I think the horizon, seen the way I see it, could be the homeland of all men.” Grace and I both thought this was particularly moving, and now in light of the immigrant crisis and the terror attacks in Paris and elsewhere, it has even more resonance. We ambled down to an artisan’s market, where I made important purchases of tinned bonito tuna in olive oil after confirming that I could indeed take it back with me to England. A real life fear is that I will one day buy goods that somehow violate the complex rules on importing and Customs will seize my food (i.e. eat it for themselves, the cruellest outcome). Since I enjoy not having a full-on meltdown in front of strangers, over tuna, the tuna man’s assurance was important. For our last dinner, we found a place that served croquettas the size of gerbils, and mains (the monstrosity below is called a cachopo and is cheese layered between slabs of beef, then deep fried) far larger than my hand. I took a poorly-shaded picture just to remember that I even once tried to eat something that oversized. Though we’d planned to be adventurous — and prove to ourselves that we were still young — by going out to a bar for some after-dinner drinks, we had eaten far too much, and by the time the check came, we both looked at each other and just said, “Bed!”. Pathetic, I know, but the stomach wants what it wants and I must not deny it. The stomach (and the heart) wish very much to return posthaste to Spain, so I’ll see what I can do about that. My dish soap (called “washing up liquid” here, because “dish soap” just seems too pedestrian?) is upfront about its abilities; it can clean but has “no added promises”. Possibly the most English product description ever. So your dishes may not sparkle or twinkle or smell like fresh daisies, but damn it, they will be clean. So of course within the week or two I begin my blog about ex-pat/re-pat life in London, I am actually in Paris with my family on a lovely vacation. The sights and views (and most importantly, the food and wine) here mean we are often ignoring the fact that we only have a few days to soak it all in. It has been a wonderful feeling, however, thinking about the idea of “home” and having that be London, rather than New York. Now that London has been my base of operations for about 14 months, I’m much more attached than I thought I’d be. The window has passed where I would have gone home immediately after my degree, as some of my international peers have done, and I’m determined to make London stick. The reality of Paris being a short Eurostar train journey away makes it all the better. 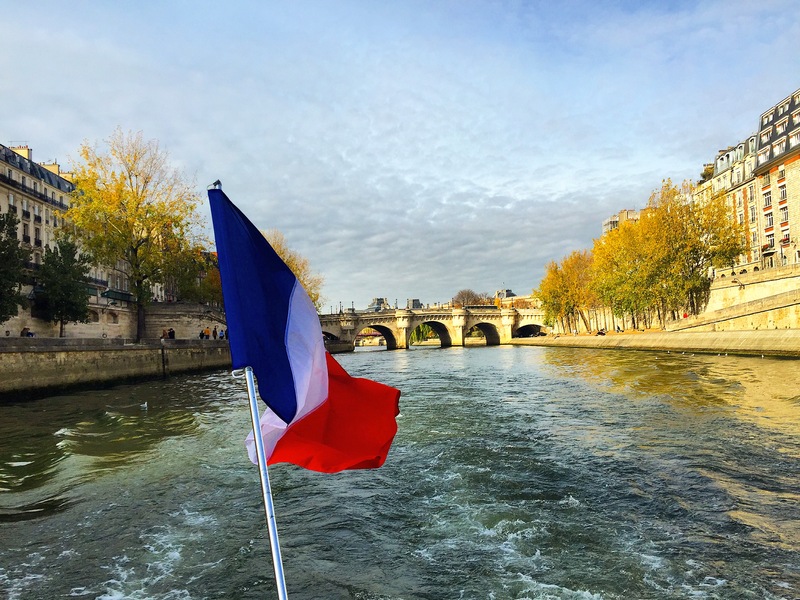 A view of a Seine tour we did in the week before the terrorist attack. I wrote the words above a few days before my family and I left Paris on Nov. 10th, and I was too busy enjoying the sights of Paris to open my computer again to finish or post the entry. As the world now knows, Friday Nov. 13 was to be a horrific terrorist attack killing 129 people and injuring hundreds more. Of course, I am incredibly grateful that we are safe, but I’m truly troubled by the terrorism that is becoming a more frequent occurrence in Europe. In the US, we are very sadly accustomed to hearing about school shootings or cinema massacres, often carried out by lone gunmen who are later shown to be mentally ill. When I moved to London, I hadn’t anticipated I would feel different about my safety, but I did and I do. Once I got used to the police not having guns (and knowing that gun control laws mean most people did not carry guns either), I felt safer than I had in New York City, where it had crossed my mind every day that I worked in Times Square, a high-risk target area. Of course, no matter where you are, if someone wants to kill badly enough, they will find the means. The Paris terror attacks were well-planned and involved several different teams of killers who stopped at nothing to bring down innocent people trying to enjoy a Friday night in their beautiful city. We cannot search every car or detain every person, and that means on some level we must trust each other. I am saddened not just by the terrible taking of life in Paris and in other cities like Beirut in the past week, but by a realization that just came to me, though it should’ve been obvious. I will likely not see a world at peace in my lifetime, and it is also likely that we, as humans, will never allow such a thing to exist. We are so much and so dangerously in our own way. Ah, The Tube. A wonder of British transportation, and of unbelievably polite ways of saying things that will ruin your commute. When a TfL (Transport for London) conductor comes on the loudspeaker to say, “We’re terribly sorry, but we are being held in station due to an earlier incident.” They don’t elaborate, obviously, that that earlier incident could’ve been, horrendously, a body under a train or it could’ve just as easily been a kid who puked on the floor of the train before yours. Occasionally they say the cause is a “sick passenger”, which I feel is liberally employed purely to activate British guilt. Moments before, you were cursing whichever rookie commuter had held open the doors too long or dropped his phone down the tracks, forcing you to miss your coffee stop on the way into the office. But with the declaration of a “sick passenger”, that rookie has morphed, in your head, into a sickly old lady who can’t help that trains make her queasy. 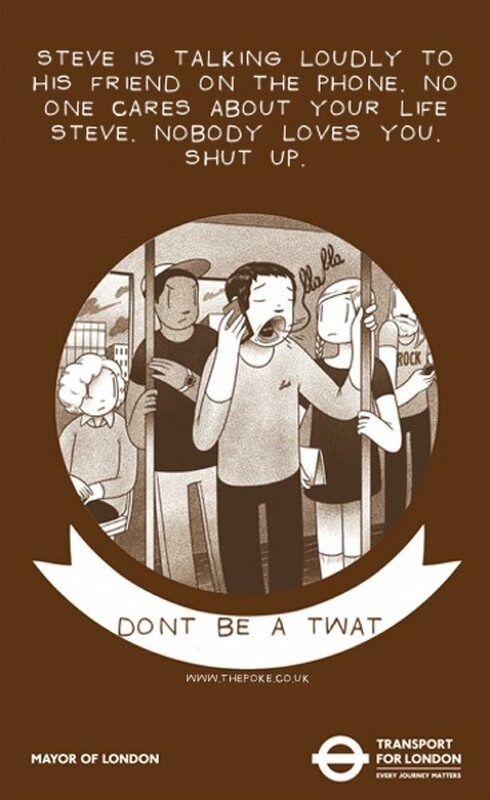 So you stand there and you shut up, just as TfL intended. 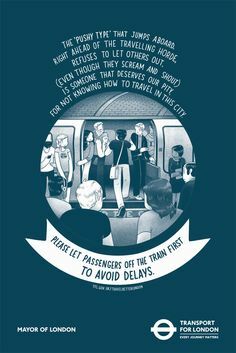 In order to keep their people in line as to what’s Britishly (I just coined a word, go with it) acceptable and what is not, TfL posts these frankly adorable poems all over the Tube and buses. The poems are so polite already, it’s any wonder they get the point across, though I suppose they are tailored for their British audience to quietly absorb. This ensures that no single person has to bear the burden of calling out another for rule-breaking. The poems are illustrative of exactly some of the problems that I and many other riders experience daily. 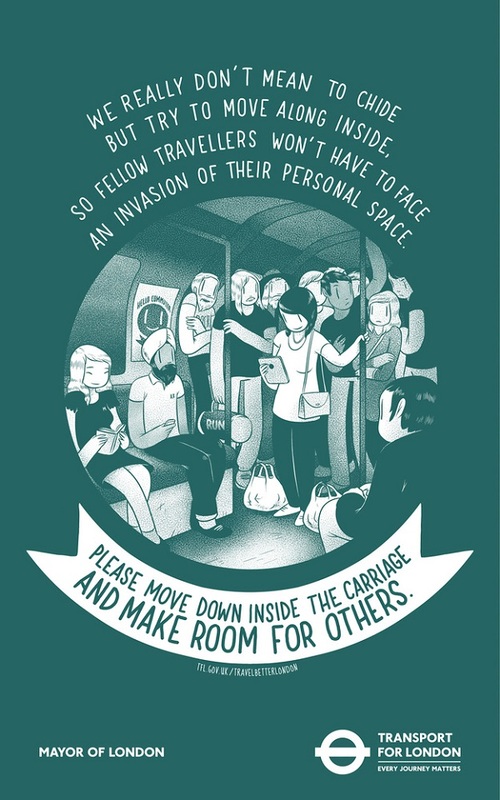 Because an invasion of one’s personal space is metaphorically akin to stabbing them in the face. Case in point: for some inexplicable reason, London commuters will not move down the length of the train unless they are physically shoved by another human. So everyone’s complaining about how the trains are jam-packed, but they’re not actually full at all — the coveted seats and the roomy vestibules are full. Look, no one wants to be like China, where there are people whose sole job it is to shove passengers into the carriages to maximize efficiency, but there’s got to be some middle ground (there is, quite literally: it’s the aisle no one is occupying). The first time I was personally affected by this travesty, my inner New Yorker kicked in. I hauled off and shouted into the carriage exasperatedly, “Can you move down please? !” and people skittered away from me like I had the plague (which I suppose an American accent seems it might bring, we heathens). Let them glare at me! I honed my glare on the subways of New York City, and it has yet to meet its match. I haven’t used it much here because I genuinely don’t want to alarm people.